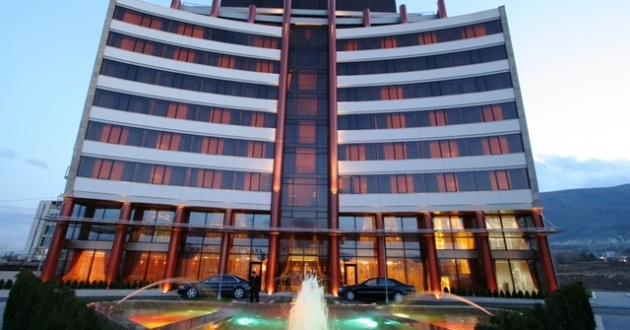 Location: Festa Sofia hotel is located in a residential area – on a 10 min driving distance from the city center and 25 min from Sofia Airport. Accommodation: The capacity of the hotel is 120 rooms. All rooms are newly furnished with spacious working desk and comfortable bed. They are equipped with individually controlled air-condition, in-room safe, direct telephone, satellite TV, mini-bar and free of charge high speed internet connection. Food: Restaurant Festa, Mezzanine bar, restaurant Orient, Whiskey & Cigar bar, lobby bar and sweet corner. Sport and facilities: Fitness center, sauna, steam bath, Jacuzzi, massage room, aromatherapy’s room, hairdresser’s and beauty parlor. Meeting facilities: Festa Sofia Hotel has a Conference room with 120 people capacity and a Meeting room for up to 25 people.